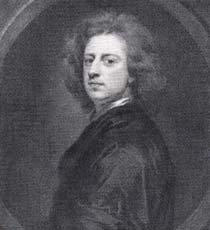 Sir Godfrey Kneller self portrait 1685. Kneller was the greatest master of the English baroque portrait. As Court painter to four sovereigns, he dominated English art for more than thirty years. Born in Lübeck, Germany, Kneller trained as a painter in Amsterdam under Rembrandt's pupil, Bol. He visited Rome and Venice probably painting portraits of Venetian nobility before coming to England in about 1676. He was appointed Principal Painter to the Court of William and Mary in 1688. He was knighted in 1692 and made a Baronet in 1715, the first painter to be so honoured. He married Susanna Grave in 1704. 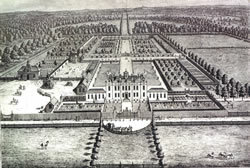 Kneller acquired a property in Whitton then known as Whitton Hall which he adapted or rebuilt between 1709 and 1711. It has come to be called Kneller Hall. Kneller Hall was large with a studio where he and a number of assistants worked. His commissions were many and his output prolific. As a member of the Kit-cat Club pledged to support the Protestant succession to the throne, Kneller painted an intriguing set of portraits - the Kit-cat Club portraits, some of which can be seen in the National Portrait Gallery. In 1713 he, together with Thomas Vernon were chosen to be Churchwardens of St Mary's, Twickenham. During their tenure they had to cope with the rebuilding of the nave after its collapse in April that year. Kneller was acquainted with Alexander Pope who once in jest complimented him on the superiority of his works to those of Nature, and regretted his absence at the Creation. Kneller who was rather vain replied " I should have made some things better". Critical of Pope's drawing master Charles Jervas, who had achieved some success and consequently set himself up with a coach-and-four, Kneller commented, "Ah mein Gott, if his horses draw no better than he does, he'll never get to his journey's end". Kneller was also a local J P, and was noted for some eccentric judgments. A soldier stealing a joint of meat from a butcher, explained that the exposure of such luxury was more than he could resist. Kneller discharged the thief and reprimanded the butcher. Pope drily commented: "I think Sir Godfrey should decide the suit, Who sent the thief (that stole the cash) away. And punished him that put it in his way". When Sir Godfrey died he left about 800 pictures in Kneller Hall which were sold by his widow. She continued to live at Kneller Hall until 1729. His widow wanted to displace the memorial to Alexander Pope's parents, on the north east wall of the gallery of the church, with a large memorial to Sir Godfrey designed by Rysbrack. Naturally Pope disputed this and was successful. 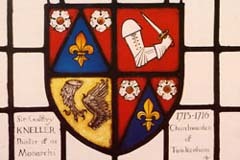 Eventually, the memorial found a home in Westminster Abbey where, Kneller had said he did not wish to be buried "because they do bury fools there". He died on 26 October 1723 in the parish of St Giles in the Fields, London as noted in the registers for that church, which also state that he was "carried away". He was actually buried in a vault in St Mary's, Twickenham which he had reserved for this purpose when the church was rebuilt. His widow died in December 1729 and is also buried in St Mary's.